This past weekend Charlotte’s Saddlery had a sale. Normally I’m pretty good about staying away from sales like this, because why tempt myself, but that $20 gift certificate that I won at the indoor eventing thing just happened to be for Charlotte’s. So naturally when I got the sale flyer I was like “perfect, I can go grab a few things that I need and see what else I can’t live without!”. I should also mention that the show we were supposed to go to this past weekend got rained out, so I might have been in need of a little… therapy. I actually had a plan beforehand. I was only going to buy things that I genuinely needed, and then if they had any white breeches that looked promising I’d try them on, or if they had a navy Kastel in my size I would buy it. See how good I’m being? Luckily for my wallet their white breeches selection was thin. I didn’t like the fabric of the Romfh’s, I already know from experience that I don’t like Pikeur’s enough to justify the price (even at 20% off), and TS are just a no for several reasons. So, I was safe there. I would have tried on the cheap Ariat breeches in Mulberry if they’d had my size, but I was safe there too. None of the show shirts on the sale rack grabbed me. No Ogilvy square pads, so I breezed right through that section too. They did have Kastel’s on sale, but no navy. Womp womp. I picked up a fancy navy with white piping grooming tote, tried to explain to myself why I needed a $30 tote instead of the $5 bucket I currently use, failed, and put it back. I paused at the saddles long enough to take this picture for Bobby (because BAM saddle in his colors) but before I knew it I had passed all the way through the “fun” side of the store. Womp womp again. 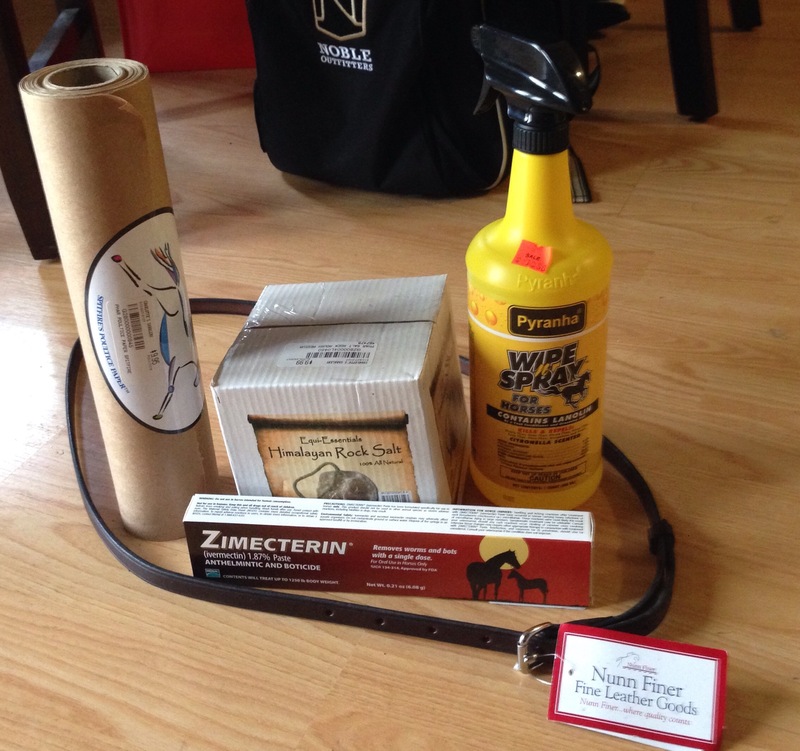 I grabbed fly spray, dewormer, and a salt block, my only actual “need” items at the moment. Now I was starting to feel a little panicked. Originally I wanted to be good and not spend much money, but now I didn’t want to be the person that came into a sale, found $20 worth of stuff, and paid for it with a $20 gift certificate. Don’t be That Guy. So I grabbed a roll of poultice papers (not totally necessary but I know I’ll use them) and found a leather Nunn Finer neck strap hanging on a peg. I’ve been thinking about upgrading to a thinner leather one, so why not? Now my haul was at least a little better (I had 2 non-sale items, at least) but I still felt bad. I even wandered back over to the Ogilvy section and stared at the plain black dressage half pad, trying to figure out how the hell I could justify a 3rd one. Sadly, I couldn’t. And that’s how I walked into a giant store-wide sale and only spent $36. I know, that’s not what sales are about. Trust me, the lack of extravagance and frivolity disappoints me just as much as it disappoints you. Seriously, it was just sad. I kept waiting to find The Thing that I couldn’t live without, but no. i was sad when i got to the end of your blog and there was no THING too 🙂 I had no idea how much I live thru your spending HA! Well… I think my I-Quip gloves will be in soon, so… that’ll be kind of exciting? For real, I really thought I’d walk out of there with another pair of whites. 5 racks of tan, one rack of white. Not spending all the money is a good thing though! I feel kind of sad inside right now…but my new Teddy’s Tack Trunk brushes might be here today, then I will be happy happy happy! And you didn’t buy it for me??? I have brought shame on my people. For that, I am sorry. That red and black saddle ❤ ! I went to two local tack stores last week hell bent on spending $$ on a pair of new schooling full seat breeches, as long as they fit and aren’t a color that will clash with my horse. Yeah. Uh. Fail. Way to go store. I was basically begging you to take my $$. It’s always so sad when that happens. I went to two tack store sales this weekend. But only winter clothes were on clearance and I don’t want to buy things I can’t wear right now. One place had 10% off store wide, but that wasn’t a good enough sale for me to bite the bullet on a Kastel shirt. The one place had an EIS shirt on sale, but it’s a medium and I liked the fit of the large better. I agree, it’s really sad to not walk away with much from a sale. You should have gotten at least something a little rainbow colored. Geez Amanda. Man I wish I could have gone to that sale… Did they have Ogilvy on sale?! They had a 20% off one item coupon (only exclusion was TS). There were only 3 half pads up there though. Still, I looked long and hard at the black one. Uh yeah my sale write up will not look like that. I was also waiting for the big reveal! I seriously did this recently though too. My amazing local tack shop had their anniversary sale and it was 20% off everything plus, since I’m a premier customer (I’m sure related to my spending at said tack shop) I got an additional 10% off. I ended up with one shirt and a bag of treats. Very disappointing really. It’s like you can’t even GIVE your money away… Sigh. Nothing worst than a bust of a sale. I live not too far from Beval in CT, and they have what used to be a HUGE sale every February. But as they’ve opened more locations, the big sale has gotten really disappointing. One year, I found a custom shadbelly (retail of $1200!) for $150. I would leave with several bags and usually at minimum five hundred dollars more poor than I started. But the last few years it was like there wasn’t even anything to buy. Do you think we’ve bought all the things??? Oh the horror.